Going through my closet recently, I came across these great puzzles from the Warner Bros. store featuring DC comic book characters. I really miss the Warner Bros. stores. They were a fantastic source for some really unique DC collectibles. 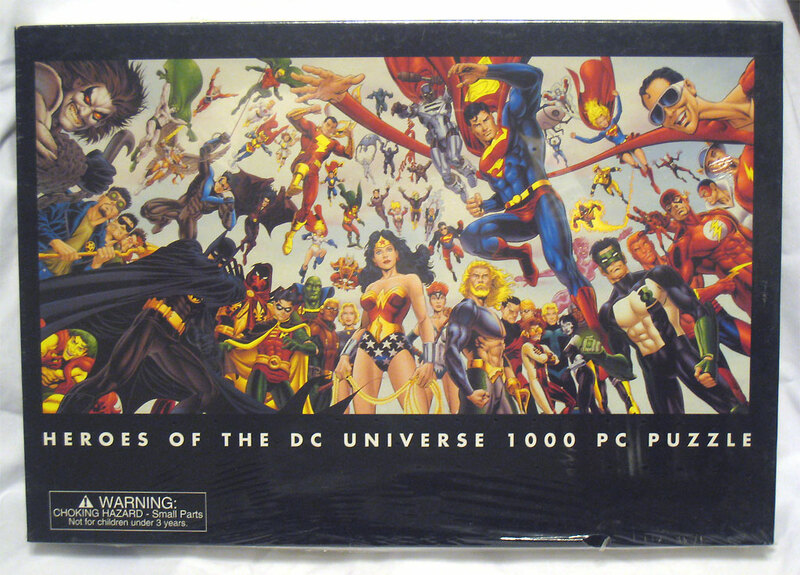 The first one — Heroes of the DC Universe 1000 piece puzzle — was released in 1999 and features most of the active characters during that time. A few notable characters that really reinforce the era this puzzle was produced during include: Jack Knight (Starman), Hitman, Artemis (in her green and white Requiem outfit), Alan Scott (in his Sentinel costume), Teen Titans (from the late 1990s series), Guy Gardner (as Warrior), The Ray, the Metal Men (including Veridium), and Fate (Jared Stevens). I can’t prove it, but I’m pretty confident this image was drawn by Dan Jurgens. The inclusion of the Teen Titans, Veridium, Booster Gold, and so many Zero Hour spin-off characters lends credence to this theory. Click to enlarge the image. 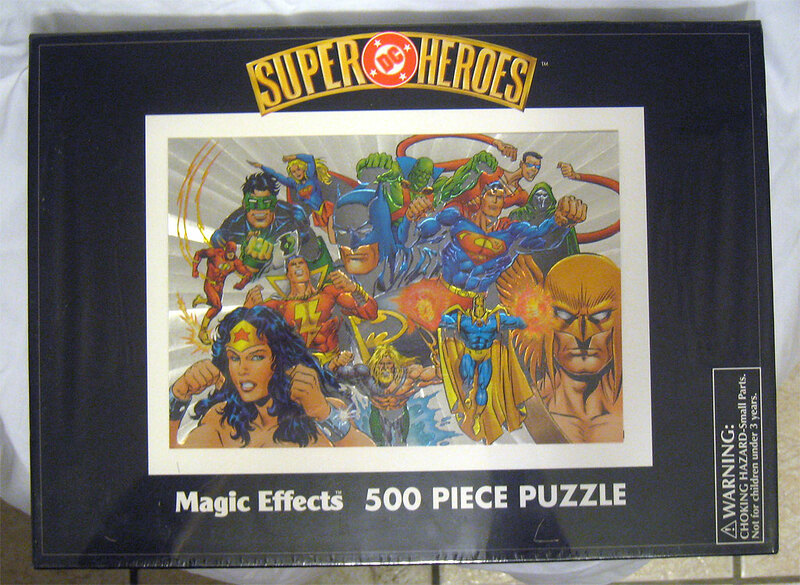 The second puzzle — Magic Effects 500 piece puzzle — came out in the year 2000 and was also from the Warner Bros. store. The art on this puzzle is a bit generic, so I really don’t have a clue who the artist is. They tried to get creative and use foil in the puzzle to make it shine — a bit too reminiscent of the foil-cover-era of comics for my liking. I probably wouldn’t have purchased the puzzle, except it had Doctor Fate on it. I mean c’mon, how often are you going to find a Doctor Fate puzzle? Also, the characters are a strange collection. The big guns of Morrison’s JLA are obviously present, but add Hawkman, Supergirl, Captain Marvel, Doctor Fate, and the Spectre? I guess if you’re going for a “magic theme” you could explain each of these. Doctor Fate & the Spectre are obvious, Captain Marvel’s power comes from the magical wizard Shazam, Supergirl around this time was an Earth-born angel, and Hawkman’s history had become so screwed up by this point that magic had been worked in there somewhere. Click to enlarge the image. Collected Editions did a fun series on putting together the first puzzle last year. Check it out by clicking here. If I remember correctly, we both bought that DC Universe puzzle from the WB Store at the same time. I couldn’t wait and had mine completed, glued and framed a few months later so many years ago. Wow, I’ve never seen that second one–and Aquaman’s on that one, too!